Our thanks for these chronologies must go to the A-Team; in particular, Don Johnson (UFOCAT) , Dan Wilson (archive researcher), Jean Waskiewicz (online NICAP DBase [NSID], Peter Davenport (NUFO Reporting Center in Seattle), and Michael Swords. You will note the many foreign reports that we are now being able to access. Midnite+. Several motorists reported sighting five discs flying along the western shore of North Island, New Zealand near New Plymouth. One of the UFOs paced a car, hovering 100 feet overhead of the vehicle, causing radio static. The UFO changed color from orange to violet as it flew. After several minutes the UFOs formed into a linear formation and flew off rapidly to the south. A silent orange object was videotaped over Deception Bay, Queensland, Australia that evening, moving from the southeast to the northwest. The video appears to show a dozen windows on the object. (Sources: UFO Magazine (USA), April 2001, p. 20; Sheryl Gottschall, UFO Research Queensland website. Cat: 2,3,8). Early Morning. ­ A bright round light approached a family traveling in a car on a road. The UFO halted, backed up, rose to the height of some power lines parallel to the road, and then paced the car. It responded to the flashing of the car headlights by “turning off.” A local power failure was reported at the same time. (Source: UFO Magazine (USA), April 2001, p. 20, citing Filer’s Files. Cat: 2,3). Evening. A luminous object hovered over Canyon Lake. Spotlights of the Army Corp of Engineers dam facility lit up the low flying object. Four helicopters appeared and attempted to surround the object, according to the married couple who witnessed it. The UFO maneuvered away, the vanished. After the helicopters departed two more UFOs appeared and returned to the site. (Source: UFO Magazine (USA), April 2001, p. 20. Cat: 2). Daytime. A metallic disc made numerous zig-zags, wobbles, and sawtooth maneuvers over a farm. It made no sound as it flew. (Source: Larry Hatch, U computer database, case 18159, citing Revista Info UFOlogia, issue #23. Cat. 1). A triangular object with lights on apexes, and red, blue, and green lights on back surface flew over Irricana making a low humming sound. The sighting lasted five minutes. (Source: Geoff Dittman, 2001 Canadian UFO Survey, case 54, citing NUFORC. Cat. 1). Evening. Three discs with lights flew over Becket. One changed color from white to red and hovered over a pond. They appeared to be chasing each other. (Sources: Joe Zalgenas, www.ufopage.com website, citing NUFORC. Cat. 1). Night. A man in Salmon Arm awoke to a noise outside his door late at night and saw a blue glow enter his bedroom. He next heard a loud buzzing sound, and then his entire body went completely tingly and numb and he was overcome by an intense sensation of fear. He found himself unable to move or speak. At this point he noticed two short shadowy figures that had appeared, almost dancing around his bed, while he was attempting to move. He managed to blurt out "get out" and the figures and the light vanished. (Sources: Geoff Dittman, Canadian UFO Survey 2001, case 105; Albert S. Rosales, Humanoid Contact Database 2001, citing UFOBC. Cat: 7). 4:10 PM. Two residents saw a luminous domed disc fly over the city off to the east. (Source: Larry Hatch, U computer database, case 18166, citing Rivista Info Ufologia, issue # 23. Cat: 1). 3:00 AM. A night watchman saw a domed disc-shaped UFO become a cigar shaped object, then zigzag away. (Source: Larry Hatch, U computer database, case #17837, citing CISU. Cat: 1). A bizarre hairy creature was sighted in the village of on this night. Hundreds of villagers armed with farm tools as weapons searched for hours in an attempt to hunt it down and kill it, but the search failed to find anything. On the same night three workers claimed they were woken up and attacked by a "masked man", who reportedly threatened to kill them in the Bhojpuri language. (Source: Albert S. Rosales, 2001 Humanoid Contact Database, citing Mystery Magazine.com. Cat: 7 but no UFO reported). 2:00 AM. A woman, "M" found herself being lifted into a whirlwind, presumably from her bedroom, but she doesn't know how she got outdoors. She was oriented vertically as she floated upwards, and was able to move her arms and look around as she did so. She approached a powerful light that seemed to emanate from a hole in the sky. She then noticed three humanoids floating next to her, who accompany her through the orifice. Looking down, she could see the roof of her house, then watched as the house became smaller, and then the city of Rosario itself faded into the distance. As she continued to ascend into the sky she fell asleep, but an intense cold wave woke her up and she heard what sounded like a metallic hatch closing. She noticed she had entered a dark room through a hexagonal opening. As her eyesight adjusted noticed that she was in an immense room with about 20 floating cots, each with a human figure on them. To her right she noticed her 45-year-old sister asleep on one of the cots. She also recalled seeing a black skinned man lying about 4 cots away. In the background she could hear a low steady snoring sound. She began to hear what appeared to be low "voices" that spoke very quickly among themselves. Almost at the same time three humanoids approached her. They were about 1.60 meters tall, very thin, with elongated hairless heads, two small holes for noses, and cat-like eyes that glowed a bluish-gray color. Their hands had three large fingers connected by a membrane and a separate finger or thumb. Their bodies were of a beige-pale color and appeared very flexible, almost gelatinous. They possessed small mouths and what appeared to be a small protuberance on top of their heads. She sensed there were both females and males present but could not see any sexual features. At this point she sensed desperation from the beings as if their time was short because their species was unable to reproduce. One of the beings seemed to measure her cranium with a thin tube about 30 cm in length that emitted a beam of light from the tip. As the tube or bar was passed over her head she felt a slight sensation of warmth. She also sensed that the aliens had chosen Earth for a reproduction staging area, acquiring the necessary materials, which were human genetic materials from both genders. She could hear other thoughts or speech in her mind, and felt that the beings talked about her and about her knowledge. At this point another one of the beings seemed to measure her face from ear to ear at the same time telling her via telepathy that everything was going to be fine. The witness felt that the aliens needed human bodies as some kind of breeding "container" for their own survival purposes. She became terrified as the three humanoids approached her to touch her. She asked them if they are spiritual beings and they answer yes, but she felt it was only an attempt to manipulate her mind. One of the humanoids attempted to touch her breasts but she pushed his arm aside and noticed that it had a gummy texture with no apparent bone structure. On her descent back to her home she remembered seeing images of famous persons flash around her, including John F. Kennedy, Adolph Hitler, and Judy Garland. She woke up in her bed with her concerned husband attempting to calm her down. (Source: Albert S. Rosales, 2001 Humanoid Contact Database, citing Horacio Roberto, Nuevos Tiempos, Argentina. Cat: 7). 10:10 PM. A man reported seeing a huge black triangular shaped craft fly overhead. He reportedly heard a "message" in his head. He also reported that he experienced some "missing time." (Source: Peter Davenport, National UFO Reporting Center, Seattle. Cat: 1). 4:30 AM. A silver cigar shaped object landed on a rural road. It ascended and hit in some trees when a car approached, then flew off at 70 mph to the west, crossing the road. (Source: Larry Hatch, U computer database, case 18168. Cat: 2). 6 PM. A flat, black V-shaped object, with no lights or sound, was suspended in the sky. It slowly rotated in place. (Source: Peter Davenport, National UFO Reporting Center, Seattle, June 2001 webpage, report posted August 5, 2001. Cat: 1). 4:10 AM. Power went out when lights flew over the city. An eleven meter long ovoid object was seen emitting a cold, white light. (Source: Larry Hatch, U computer database, case #18173, citing Filers' Files, Vol. 1, No. 28. Cat: 3). Evening. A couple riding bikes in a wooded area of observed a group of tall humanoid beings covered with brown hair. They seemed to be holding or carrying unusual devices. The hairy beings fled into the woods when they noticed the witnesses. Around the same time there were numerous reports of low flying glowing orange disc-shaped UFOs over the area. (Source: Albert S. Rosales, Humanoid Contact Database 2001, citing Unknown Country & CAUS. Cat. 7). Night. Odete Fortini was standing on the verandah of her house when she observed a ball of light approach and land about 200 meters away. When the light dimmed she could see that it was a disc-shaped object with a cupola on top and several small windows around its circumference. In the center of the object a door opened, and two one-meter tall humanoids stepped out. They appeared to be interested in the vegetation around the object. After a few minutes of investigation, they re-entered the object, which became bright again and took off at high speed. (Source: Albert S. Rosales, Humanoid Contact Database 2001, citing Thiago Luiz Ticchetti, EBE-ET. Cat: 2,7). Same night. Eight-year-old Zeca Borba of reported encountering and communicating with a short bluish-skinned humanoid with a large head and big eyes. The humanoid carried something that looked like a cane, and wore a silvery helmet. After 30 minutes the humanoid boarded a triangular shaped object, which quickly disappeared. (Source: Albert S. Rosales, Humanoid Contact Database 2001, citing Thiago Luiz Ticchetti, EBE-ET. Cat: 2,7). Night. Jose Da Silva in saw a large disc-shaped object with several windows and a small doorway into which two two-meter tall humanoids were seen to enter. Immediately after boarding, the object began to spin very rapidly and rose slowly from the ground. It then emitted a sudden bright flash of light from the top section, and vanished in front of the witness. (Source: Albert S. Rosales, Humanoid Contact Database 2001, citing Thiago Luiz Ticchetti, EBE-ET. Cat: 2,7). 1:08 PM. A spinning diamond-shaped object made a whizzing noise as it flew over at a high velocity. (Source: Peter Davenport, National UFO Reporting Center, Seattle, July 2001 webpage, report uploaded on August 5, 2001. Cat: 1). 10:15 PM. A set of flashing mulitcolored lights was seen on a hilltop. They dip behind hill and reappear as rectangular strobing craft. (Source: Peter Davenport, National UFO Reporting Center, Seattle, July 2001 webpage, report uploaded on August 5, 2001. Cat: 1). 9:30 PM. A young mother was breastfeeding her baby in her fourth floor apartment when she turned her head and saw a strange looking humanoid standing in front of the balcony door and curtain. After a few seconds the humanoid disappeared. She described it as about 1.05 meters in height, with very big jet-black eyes, slanting up. His head was oval-shaped and bald. His color was gray like smoke. No other details were noted because of the witness state of panic and the short duration of the encounter. There were unconfirmed reports of UFO's seen in the area that night. (Source: Albert S. Rosales, Humanoid Contact Database 2001, citing TUVPO. Cat: 7). 9:50 PM. Two witnesses saw a luminous figure walking on the side of the road while driving on the road to . It seemed to move clumsily about in an attempt to enter the nearby field. The frightened witnesses accelerated away from the area. They described the figure as about two meters to 2.15 meters in height, strongly build, and robust looking. It emitted a bluish-white light. (Source: Albert S. Rosales, Humanoid Contact Database 2001, citing Jose Manuel Garcia Bautista & Rafael Cabello Herrero. Cat: 7; no UFO observed). Night. Several witnesses at different locations reported seeing a dog rise up into the air from near the ocean and enter a hovering, lighted spherical object. The object had a large lighted window and a tall man-like figure could be seen looking out. It then flew away. The dog was apparently taken. (Source: Albert S. Rosales, Humanoid Contact Database 2001, citing Leonard Da Vinci Research Group. Cat. 2,7). Jul. 29, 2001; Quedas do Iguacu, Parana, Brazil. 3:00 AM. An object larger than 10 meters in diameter was seen on the grounds of the local football field in The two witnesses, including Rubem Bastos de Brito, reported seeing several short bizarre creatures moving around the object. After about 20 minutes the object shot away into the sky. (Source: Albert S. Rosales, Humanoid Contact Database 2001, citing Thiago Luiz Ticchetti, EBE-ET. Cat: 2,7). 6:00 AM. EDT. A farmer encountered a square flying object, about the size of tire (3 feet wide), that was hovering inside his barn. It was black with gray markings, and floated for a few seconds before it flew out the barn door. A cow had been poked by a needle in one of its ears, and its eye had a broken blood vessel. (Source: George A. Filer, MUFON UFO Journal, October 2001, p. 11. Cat. 2,6). 7:00 AM EDT. A cigar-shaped object was seen moving slowly above the tree line in for two minutes. It emitted a bright object from one end that shot into the sky. (Source: Peter Davenport, National UFO Reporting Center, Seattle, August 2001 webpage, report uploaded August 12, 2001. Cat: 1). 2:00 AM. Five geography students camping oin a deserted beach in , including Luis Carlos Prima, reported seeing a large disc-shaped object about 10 meters in diameter land on the beach. The students had been sleeping when a very strong wind suddenly woke them up. The wind was so strong that it began to disconnect the ground ties of their tent from the sandy ground. Thinking it was a storm, they ran out and were confronted by the huge disc, which had numerous bright lights on its top and windows in the center. A small door quickly opened and two short humanoids came out. The UFO and the humanoids were about 200 meters away from the witnesses. The little men seemed to be collecting ground samples when they became aware of the presence of the students. They ignored them and after several minutes reboarded the craft, which took off at high speed. Deep ground traces were found at the landing site. (Source: Albert S. Rosales, Humanoid Contact Database 2001, citing Thiago Luiz Ticchetti, EBE-ET. Cat: 2,5,7). 3:00 AM. The same night that Carmelo Sepulveda found one of his rabbits decapitated and another injured, one of his neighbors heard rabbits squealing and turned on an outside lightbulb that faced toward the animal cages. He then went outside to take a look, and saw something resembling a child standing next to one of the cages. However, the poor lighting was not sufficient to let him make out any details. The figure quickly took shelter among Sepulveda's cages and the rabbit's squeals stopped. (Source: Albert S. Rosales, Humanoid Contact Database 2001, citing Jose A Martinez Echevarria, PRRG. Cat: 7, no UFO reported). Night. Ms. M. felt herself summoned by aliens, and she felt herself traveling through a tunnel of "water" or something that felt like water. She soon found herself in a jungle that was very hot. Next she found herself in a mansion all white in color, and it gave her the impression of being in a hospital. Inside the building she saw numerous children of both sexes that apparently lived there. The children were barefoot and wore white, loose fitting outfits. She also saw human adults that identified themselves as the "instructors". The children looked human but with some alien traits, "almost like hybrids." The aliens told her that soon they would be leaving the Earth due to the coming chaos and cataclysm. She saw an image of a huge explosion and many injured persons. (Source: Albert S. Rosales, Humanoid Contact Database 2001, citing Horacio Roberto, Nuevos Tiempos, Argentina. Cat: 7). 8:30 PM. A black rectangular object, quiet with no lights, flew right over a couple driving (Source: Peter Davenport, National UFO Reporting Center, Seattle, August 2001 webpage, report uploaded August 5, 2001. Cat: 2). Aug. 4, 2001; Ricksmanworth, Hertford, England. 12:40 AM. A large, circular object was seen in the sky surrounded by a number of small fragmentary objects, the size of 10p (penny?) pieces. The large object was white and had a glow of red and blue, and was described as very bright. At the same time in Port Talbot, Wales two large shining white golf ball like objects were seen moving in and out of the clouds. An hour later another strange formation of lights flew overhead in Bushey, Hertford. At 2:30 a.m. over Glasgow, Scotland a small white light was seen moving toward and away from a larger white object. (Sources: British Ministry of Defense 2001 reports, cases # 134-137). Night. At the local "Hospital del Torax" nurse Wilma Huanapaco was working the night shift in the intensive therapy wing on the first floor when she was suddenly seized by a strange stupor that paralyzed her body. She was unable to move her arms, legs, or even her eyelids. Using tremendous effort, she finally was able to turn around and was confronted by the figure of a tall man, who was enveloped in a green aura and apparently headless. The figure suddenly vanished in plain sight. Wilma remained in the stupor for several more minutes. (Source: Albert S. Rosales, Humanoid Contact Database 2001, citing Abdel Padilla Vargas, La Prensa, Bolivia. Cat: 7). Aug. 14, 2001; over Strathroy, Ontario, Canada. 10:45 PM. Twelve white objects were seen performing maneuvers. They were first seen in a triangle, which then formed into a circle, and they performed aerial aerobatics for the next several (15) minutes. (Source: Geoff Dittman, 2001 Canadian UFO Survey Report, case # 235, citing National UFO Reporting Center, Seattle. Cat: 1). On this day a huge dark silver-gray disc-shaped UFO was observed for 7-8 minutes . It flew low and slowly over a residential neighborhood. (Source: George Filer, MUFON UFO Journal, November 2001, p. 14. Cat: 2). 11:05 AM. A single witness was driving north on 82nd Street when he saw four UFOs take off from ground level, one at a time. (Source: Peter Davenport, National UFO Reporting Center, Seattle, August 2001 webpage. Cat: 1). 7:29 PM. A little disc-shaped object zoomed out of the bushes and right over the vehicle person was driving in. (Source: Peter Davenport, National UFO Reporting Center, Seattle, August 2001 webpage. Cat: 2). 10:00 PM. An intense white light buzzed a car, illuminating the cab of the car while driving out in the country. (Source: Peter Davenport, National UFO Reporting Center, Seattle, August 2001 webpage. Cat: 2). 3:10 AM. A triangular object with three lights made "rapid and unbelievable drops" and loops in the sky The sighting lasted 20 minutes. (Source: Geoff Dittman, 2001 Canadian UFO Survey Report, case # 258, citing UFOBC. Cat: 1). At 11:15 PM. A witness at a campsite observed the passage of a triangle delimited by three luminous points in the sky. It was quiet and its passage lasted a few minutes. The son of the witness tried in vain to film it. (Source: GEIPAN, case # 346. Cat: 1). 4:30 AM. A small red light on a disc-shaped object, about three feet in diameter, quickly darted about in the witness's garden, whirring faintly. (Source: Peter Davenport, National UFO Reporting Center, Seattle, August 2001 archived webpage, report uploaded December 9, 2003. Cat: 2). Three carbonized circles of vegetation between 30 and 40 centimeters in diameter were found in a field, forming an isosceles triangle. (Source: GEIPAN, case # 347. Cat: 5, no UFO observed). 6:55 AM. Several motorists spotted a blimp-like UFO with a smooth surface that was glowing bright red in the overcast daytime sky. A chevron-shaped object exited from a door in the bottom. There was no sound during the entire incident, which lasted five minutes. The two objects vanished at the same time. (Source: UFO Magazine (USA), February 2002, p. 21. Cat: 2). Oct. 31, 2001; Ozaukee, Wisconsin. 8:30 PM. A huge triangular-shaped object with a white light in the center was seen traveling at a high speed across rainy sky. The witnesses saw rain pelting off the back of the UFO as it flew off, and then disappeared. (Source: UFO Magazine (USA), February 2002, p. 20. Cat: 2). 8:03 PM. A cluster of small lights was seen between two larger red lights over the M62 highway by a police woman. The red lights oscillated between various shades of color. They hovered for ten seconds, then shot off at a high rate of speed. There was no sound. There was broken cloud cover at the time, with a light rain. (Source: UFO Magazine (UK), July 2003, p. 11. Cat: 1). 8:00 PM. A huge diamond-shaped UFO with an elongated bottom, a light on each end, and an orange light in the middle, flew toward the northwest. In five minutes it came back heading southwest. When over the city all the lights started to spin around, and the light on the right side veered off from the main body. 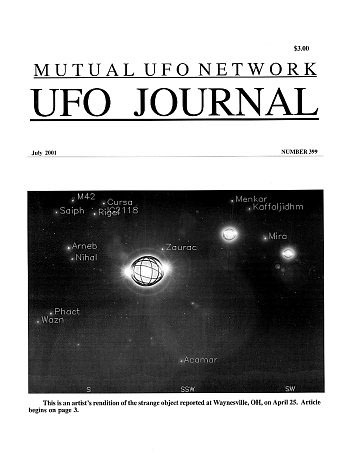 (Source: George Filer, MUFON UFO Journal, January 2002, p. 18. Cat: 1). 5:30 AM. A V-shaped bank of lights flew from north to south. It made no sound, and the rear lights where offset a little from a straight line. (Source: George Filer, MUFON UFO Journal, January 2002, p.17. Cat: 1). That night, at 11:45 p.m., five bronze lights, each elliptical in shape and all the same size, flew over in a V-formation. They made no sound. The witness was aware of the Leonid meteor shower, and said these lights could not have been meteors. (Source: George Filer, MUFON UFO Journal, January 2002, p.17. Cat: 1). 9:20 PM. Many people witnessed a brightly lit object move across the sky chased by F-16 fighters. The UFO changed directions several times. According to the witnesses, the jets fired missiles at the UFO and hit it, causing it to explode in the air. According to NORAD they witnesses the re-entry of a Russian satellite. (Source: UFO Magazine, April 2002, p. 20, citing Filer's Files. Cat: 1). A retired French gendarme sighted a multi-colored revolving triangle in the sky . It had blue lights in the three corners, and a brilliant yellow light at the bottom. (Source: Michel Bougard, Inforespace, June 2002, p. 40. Cat: 1). No time given. A gigantic flaring light descended and was visible for hours hovering above and outside San Ramon Hill. The object was reported to be "as large as a stadium." (Source: UFO Magazine (USA), April 2002, p. 20, citing Filers' Files. Cat: 1). 6:07 PM. A retired military pilot saw a large, bright object in the western sky. It moved rapidly toward the east at a high speed. It was disc-shaped with a "teardop-shaped aura". He estimated it was moving at Mach 3 when it vanished abruptly. (Source: UFO Magazine (USA), April 2002, p. 21. Cat: 1). 3:00 AM. There were many reports of a circular glowing object circling the metropolitan area. The object was reportedly viewed through binoculars. (Sources: Larry Hatch, U computer database, case 17848, citing UFO Roundup; UFO Magazine (USA), April 2002, p. 21, citing Filer’s Files. Cat. 1). 7:20 p.m. An amber colored, low flying triangle moved through the sky toward the southeast. Within its structure it had many "translucent spheres or orbs interchanging within it.” In flew off in the direction of Fayettesville. (Sources: Larry Hatch, U computer database, case 17848, citing UFO Roundup; UFO Magazine (USA), April 2002, p. 21, citing Filer’s Files. Cat. 1). Dec. 17, 2001; in Brevard, Florida. 7:30 PM. ­ A low flying, slow moving Saturn-shaped UFO flew to the south over the river. (Source: UFO Magazine (USA), April 2002, p. 20, citing Filer’s Files. Cat: 1). ­ 1:20 PM. A four minute long videotape was shot of a dark, domed ovoid object. It had a peculiar knob shape on the bottom of the object. It shot off with extreme acceleration. (Source: Larry Hatch, U computer database, case 17849, citing J. Trainor, UFO Roundup. Cat: 1,8). 10:10 AM. A sighting of a triangular-shaped UFO was made by a witness. This daylight sighting was of a triangular-shaped wedge with three blue lights in the corners, a yellow light in the center, and a red light on the side. (Source: Michel Bougard, Inforespace, June 2002, p. 40. Cat. 1). Evening. A man reported seeing a huge rectangular object, an estimated 300 meters in length, about ten miles away. The UFO hung vertically in the sky at only a few hundred feet altitude, and had several white lights inside a red rectangular outer rim. (Source: George A. Filer, MUFON UFO Journal, February 2002, p.14. Cat: 1). 4. Joan Woodward, Animal Reaction Specialist.